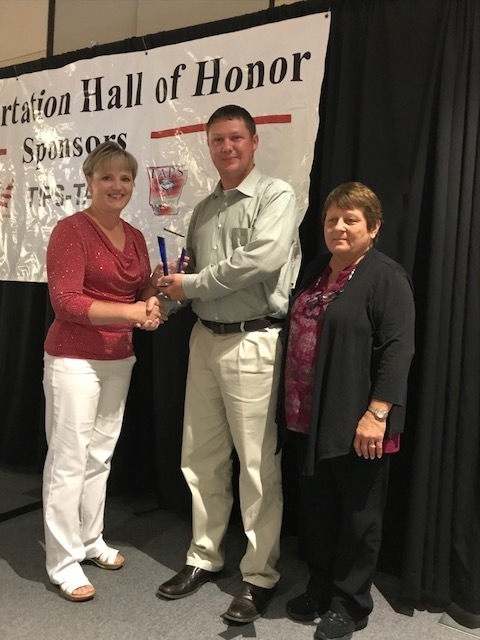 Casey Smith, SSD fleet and shop supervisor, was honored at the Arkansas Association of Pupil Transportation (AAPT) Annual Conference on Tuesday, July 17, 2018 at the Hot Springs Convention Center. Each year, the AAPT recognizes outstanding school bus transportation personnel from across the state. Casey Smith received the Award of Excellence. According to SSD Transportation Supervisor Rhonda Harris, this award is designated for individuals who have no fault accidents in any vehicle for a period of two years preceding the date of application; demonstrate a thorough knowledge of equipment, safety laws and local policy; demonstrate excellence in customer service; go the extra mile to make sure students, fellow drivers, administration and parents are satisfied; and go above and beyond to serve others with a positive attitude. "Casey Smith definitely meets all of these qualifications!" said Harris. "He always has the safety of our students on his mind. He arrives at the Bus Shop 6 a.m. and sometimes doesn't leave until 6 p.m. His care and concern for the safety of our kids, staff, administration and parents are top notch. We are proud of Casey Smith!"